Every other Friday evening a different Falconbridge resident hosts the Traveling Pub. 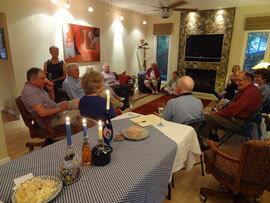 It's open to all residents and offers a pleasant environment to meet new friends and chat with old. Guests come and go any time between 5:30 and 7:30. Guests bring their own beverages. The hosts only need provide glasses and simple snacks so hosting isn't a burden. For the date of the next Traveling Pub and any other information, send an email to falconbridgepub@gmail.com.